1) When you wake, the first words you speak must be none other than, "Rabbit, rabbit." note: this is doubly important if your birthday occurs during the month as you will receive double the luck for your birthday month. 2) If, for whatever reason, you've forgotten to utter the words, "Rabbit, rabbit" before any other, all hope is not lost. You can say the phrase backward as the last thing uttered before falling asleep that same day. The phrase, as we all know, is "Tibbar, tibbar." There are some who believe that 'tagging' another person with the "Rabbit, rabbit" phrase will actually steal that person's luck for the month and give it to you. I have had some hectic episodes of calling people across time zones just to say "Rabbit, rabbit" first—stealing their luck and, more importantly, hearing my victim cry out from the agony of being 'tagged' again. 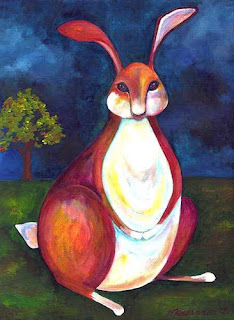 While this last modification to the rabbit rabbit movement can be fun, it can also lead to heated debates when it comes to time zone disputes or even if the luck-stealing can be accomplished via an Instant Message or telephone call. To these debates, I feel the rule of thumb is to simply decide on the rules of engagement with those you intend to 'tag' or be 'tagged' by and deal with the coming storm of luck-stealing. Oh, by the way, if you're reading this today (September 1st, 2005) then I've just stolen your luck. Please come back on the 1st of next month so that I may add your luck to my growing collection again...muwhahaha!